Tobias Batley and Martha Leebolt as Winston and Julia in 1984. Photo Emma Kauldhar. 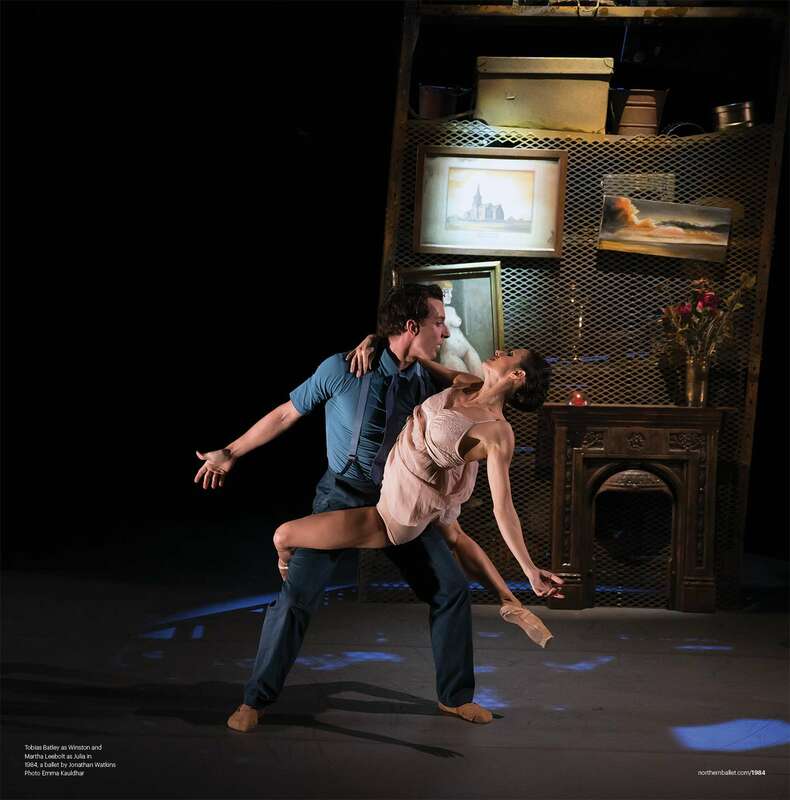 To this day, Northern Ballet’s The Great Gatsby is the most beautiful thing I have ever seen on a stage, so I was excited and intrigued to see what the company would do with another classic novel, albeit a completely different genre and tone. What they’ve created is another spine-tingling masterpiece. 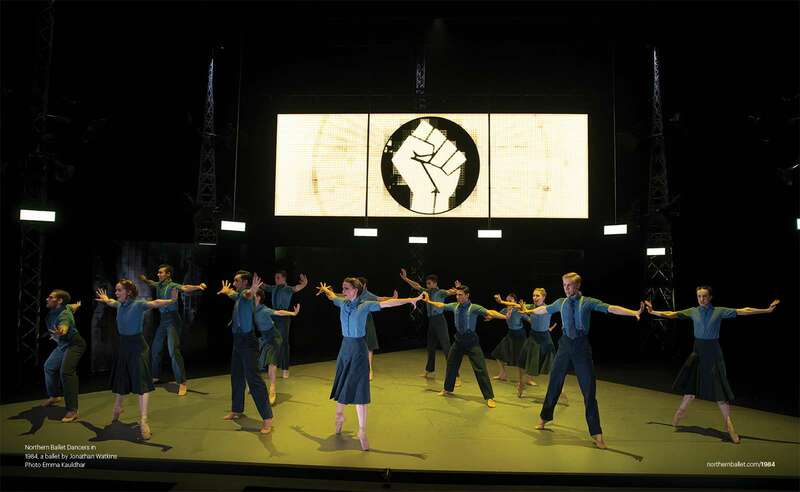 Jonathan Watkins’ choreography is created with all the intricacy and intelligence necessary to portray the complex ideas and changing moods within Orwell’s book. The workers’ unison sections are very crisp and powerful, with many recurring motifs of straight lines and triangles, both in individual movements and formation, which cleverly reflect the “all seeing eye”. Canon variations are used throughout for interest, which work very well to create production line style sequences, again very relevant to the era. In contrast, the Proles’ movements are easily identified through curves, contact improvisation and individuality of style. The lovers’ duet captures all the breath-taking beauty one might expect from a traditional ballet, while the fight scene towards the end is both graceful and gutting, as we see Winston fall and give in to the higher power. Alex Baronowski’s score is full of accented beats and staccato rhythms which perfectly translate to the repeated motifs of the workers under the control of Big Brother, while the more romantic elements are brought out with strings and flowing, rousing melodies. Much like experimental music of the time, the orchestra uses an assortment of non-traditional instruments to create clashing tinny sounds and altogether this results in an authentic, haunting and sympathetic accompaniment to the action on stage. Northern Ballet dancers in 1984. Photo Emma Kauldhar. While the relationship between music and movement are clearly intertwined, the design of this production seems equally balanced with the other elements. Chris Davey’s lighting is stark and structural, creating yet more triangles and straight lines for the dancers to follow and stay within, and Simon Daw’s set of moving walls and simple blank spaces adds to the feeling of isolation and hopelessness. Use of colour is also very powerful, from the traditional blue of the workers uniforms, to the bright yellow of hate to the oranges and browns of the Proles, this is clearly a production that pays high regard to many details, making it a joy to watch. As can be expected in such an interpretation, not every nuance of the book is covered on stage, and sacrifices have to be made to adapt the work for this new form. 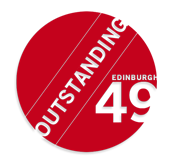 It’s a shame that some sections aren’t made more of – the final quarter in particular seems a little rushed – but overall the piece strikes a fine balance between narrative progression and beauty of form. For those unfamiliar with the story this production may be somewhat difficult to follow, but even then, the artistry on display is of such high quality that it almost doesn’t matter. Visit the Festival Theatre archive.